She dreamed of a black Mustang. She dreamed of a mansion set high on a hill. She dreamed of maids and cooks, landscapers and pool boys. She dreamed of walking Paris on cool, fall day. In her dreams, in her ideal life, there was never a question she could afford these things. Emily’s eyes were closed, her thoughts on which pedicure she should get before climbing the Eiffel Tower, when she heard the soft patter of rain begin on her roof. Reflexively, she reached up and grabbed loose cardboard and angled it down so most of the water would drain away from her temporary home. She looked out at the sky and decided it was a small rain, and her box would still be structurally sound by the end of it. No need to find a new place to sleep tonight. She stuck her finger into a puddle starting to form within reach and used the wetness to draw a sketch on the inside wall of her pliable abode. 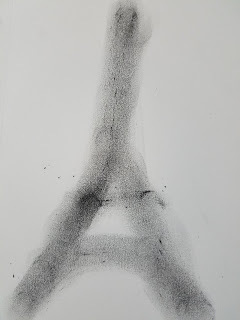 It was a crude drawing of the Eiffel Tower. She stared at it, thinking all her problems would be over if she could only find her way to Paris. Maybe it was a past life, or something she saw in a movie as a child, but she knew deep in her soul that the City of Lights belonged to her--or that she belonged to it. She made her finger wet again to touch up the already-evaporating lines of her art and she saw her ring on her hand. The ring. Her last possession of any worth. It was her mother’s wedding ring, the only item left after her parents estate was settled after they died so young, with her so much younger. The ring was her only tie to her past, to a memory of a normal life. It was also her only hope for her future, worth enough to buy her way to Paris. But how? How was she supposed to choose between her past and her future? The ring or Paris. Her heart desired both, but how does one decide between two things when the choice means throwing the other away forever? She only knew of one way to have both. Ring still on her finger, she sat back and closed her eyes and prayed that she would go right back to her dreams of Mustangs, and mansions, and Paris.